As a part of the ongoing #MyCareer quarterly we had the chance to speak to two budding authors working in the YA and poetry writing space, covering everything from faith to the growing diversity in the industry. Given that Muslims are often misunderstood and misrepresented in the real world, these authors are pioneering the introduction of Muslim characters in mainstream teen fiction and battling stereotypes simultaneously. Sahira Javaid and Hafsah Faizal felt inspired by their own religion and culture to create characters and settings that are both fantastical and relatable to the young adult audience while non-invasively integrating Islamic values and culture. 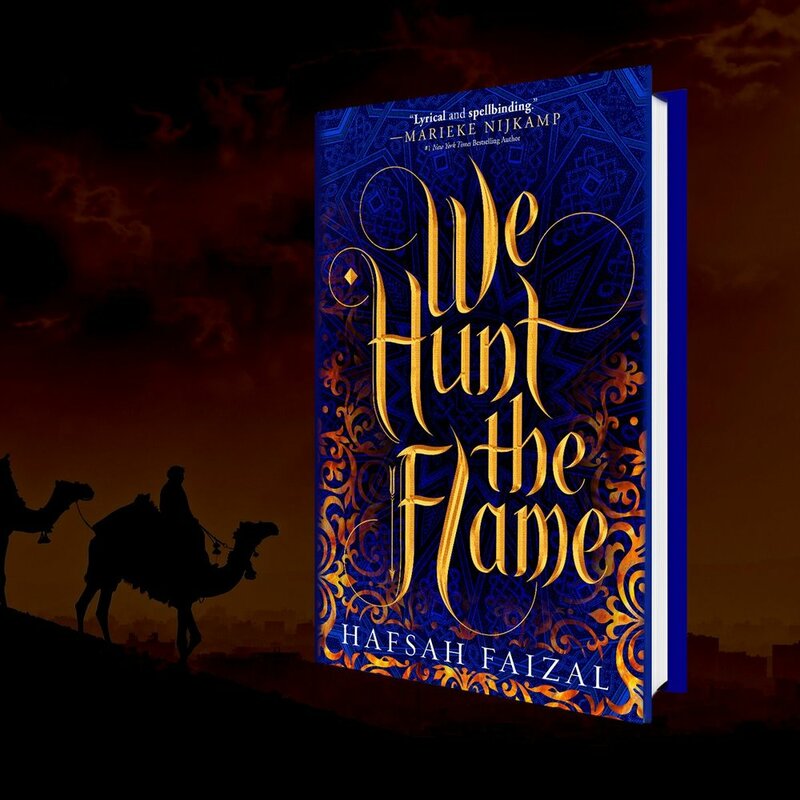 Hafsah is an American Muslim author whose first YA novel, “We Hunt The Flame” will be released in May 2019. Faizal started writing the book as a teen and draws inspiration from her own culture. To her, it made sense to pick fantasy to tell this story because it’s the genre she consumes the most of. Also noting that a fantastical and Ancient Arabia serves as a wonderful world to dive into. If you haven’t already, make sure to make room on your bookshelves for the stellar YA books written by Muslim authors. What does being a Muslim YA (Young Adult) fiction author entail? It means persevering, fighting, and holding fast, just as any author would—but tenfold. The gates of publishing are tough to penetrate, but when you’re an anomaly to the system, something outside the norm, it’s that much harder. That said, I believe anything is possible when you stay true to your beliefs, and Alhamdulillah, I’ve been blessed to work with some of the greatest people in the industry: from my agent (and the many agents who were ready to back my work), my editor (and the many editors who fought for the book at auction), and now the team at Macmillan Books For Young Readers, who are championing me and ‘We Hunt The Flame’ in ways I could only have dreamed of. I’m a self-taught web designer and developer who happens to have found her niche in publishing. Through my business, IceyDesigns, I create websites for authors and industry professionals, and have expanded to an online storefront dedicated to goods designed by me. I do not have any certification in writing, and I believe all you need is perseverance! What is the process a writer needs to go through to get published? If you’re aiming for publication at one of the big five houses, you must have a completed manuscript. Once you do, polish it to the best of your ability and query literary agents. I suggest a website such as QueryTracker.net to help research agents, their reputations, and the sort of material they’re looking for. Then, put together your query letter and send it off! You may receive requests for as little as fifty pages or the entire manuscript. If you don’t get an offer of representation, don’t fret! Publishing is a long game made of resilience and the honing of your craft. Keep trying! How is it working with publishers? Do they have any influence in the way you write stories? In a way, yes. But only very slightly. Once you’ve signed with an agent, their job is to sell your manuscript. When my agent shopped my manuscript around, we received offers from multiple publishers. I then chatted with each of them, discussing their editorial plans and the like. A publisher’s—or editor’s, I should say—job is not to change a story to fit their vision, but to help an author tell the story they’re trying to tell. To help them clear up the mugginess, and at times, steer the story in the direction to properly fit a niche or market. Oftentimes, the editor will identify the problem and suggest solutions, but it’s ultimately the author’s job to decide how they’ll fix the issue. So yes, they do have some influence! What is the greatest source of inspiration for your writing? I draw inspiration from everywhere—my travels, my work, but I think I draw the most from other works of fiction, particularly fantasy! Did you have a specific audience in mind when writing your book? There’s something magical and, at the same time, poignant about the teen and early adult years. There’s a great sense of the unknown, and I’ve always been drawn to young adult fiction because of it. We Hunt The Flame is geared toward young adults—either for that reason, or maybe because I was a teen when I began writing it! Why did you choose the genre of fiction to tell this story of “discovery, conquering fear, and taking identity into your own hands” ? You are what you read, and as someone who loves fiction, primarily fantasy, I couldn’t think of any other medium to write for. Readers are constantly searching for the next world to dive into, and there’s a bit of surreality in being able to connect with a character in a land worlds apart from your own. With ‘We Hunt The Flame’ I wanted to achieve that same feeling, but also create a place readers could connect with, drawing the world of the Middle East—which is sometimes seen as an apprehensive, ‘outside’ force—closer. Your book has been called the next ‘Game of Thrones’. How would you feel about your book making it to the TV screen? I would be honored! Carrying on from my previous mention of the Middle East, I think it would be enlightening to see a sweeping fantasy set in a world inspired by ancient Arabia! What was your biggest challenge when writing this book? I’d say the biggest challenge was finding time! This manuscript took me over four years to write, because I began it around the same time IceyDesigns took off, and it was hard to justify spending time on it when I could be growing my business! When did you realize you could “write”, was there a person who encouraged you to do so? It all started with a really crazy dream. I woke up the next morning with a story just waiting to be told, and my dad encouraged me to write it! That story ended up being shelved away, and five manuscripts later, ‘We Hunt The Flame’ —inspired by very different elements—was born. Have you ever felt your personal faith has conflicted with your career? And if so, how? Never. I put my faith first, and all else second. How can you go wrong when holding firm to the deen? There are more hurdles to get through, and more barriers to pass, but ultimately, everything works out beautifully. Alhamdulillah! This November we will be sharing the stories of Muslim professionals who work in unique industries around the world. From sporting professionals to angel investors, stay in the loop with our content by checking out the page below and following us on all our social platforms.